More iPad accessories have been showing up! 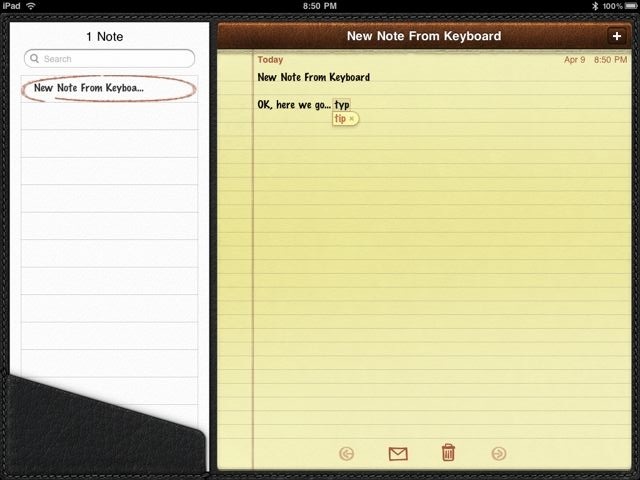 Two types of keyboards for the iPad. We have been writing about wishing for being able to jot quick notes as we move from office to office. There is the on screen keyboard that works well for when your at your desk on a call or in an hour or two meeting. For longer meetings, we really desire a more robust full keyboard. Apple offers two options. A Bluetooth keyboard and a keyboard attached to a iPad dock. The keyboard/dock combination is truly a single unit. This is not a dock plugged into a keyboard. There is a single piece of plastic along the bottom for both. They are the usual small/thin aluminum keyboard and the std iPad dock, in this case though they are joined. To use, you sit the iPad onto the dock like you would the regular standalone dock. Then, start typing. There is no set up. Anywhere you can type with the onscreen keyboard, you can now type with the hardware keyboard. The onscreen does not pop up so you have more of the text room on the screen. The keyboard in this unit has special keys for the iPad… along with the screen brightness and volume, you can also bring up the photo screensaver. Tapping any key wakes the iPad, there is no need to swipe the normal slider when turning on the iPad. When we had seen these at the iPad launch, there was concern since the iPad has to be ‘tall’ in portrait view which we thought would be distracting in a meeting. We are happy to report that the top of the iPad is actually lower then the top lip of a open standard notebook. A negative that we notice though was due to the lack of a Function key you loose the ability to forward delete letters. 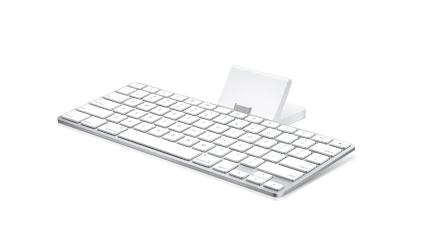 The second keyboard is the standard Apple Aluminum bluetooth keyboard. This is the preferred option for team members that carry their iPads in a jacket or case since the Dock option requires you have a iPad with nothing on it. The Bluetooth option requires no hardware connection so if you have a Apple thin case you can have the iPad in landscape or portrait view as you type. If you go the Bluetooth direction, you will need to go to the settings area of the iPad and turn on Bluetooth. When your iPad discovers the keyboard you will be given a number to type into the keyboard to pair the two. In the future it is just a matter of both units being on for the keyboard to work with your iPad. Battery life will be shorter than the keyboard/dock option since you have a Bluetooth wireless connection having to be maintained between the two. As well, the Dock option has a sync/power plug and a audio out. Making it a nice choice to have on your desk, while the Bluetooth keyboard is thin and light for taking into any meeting. Either way you go, the pair will be smaller and more managable than just about any notebook with similar screen size. Except you don’t always have to take a keyboard with you – the iPad still works happily without a hardware keyboard. As we mentioned above, you can use the keyboard just like the onscreen built in option. As you type, you will be presented with word guesses the iPad normally does – just space to accept. One missing feature is forward delete… without a Function key on the keyboard/dock solution you loose that option. Should make spreadsheets via Numbers really rock along!